After having a successful first Silom/Charoenkrung Gallery Hopping Night back in December 2014, many people have express their interest in having this as a regular event in Bangkok. And we will not disappoint you! 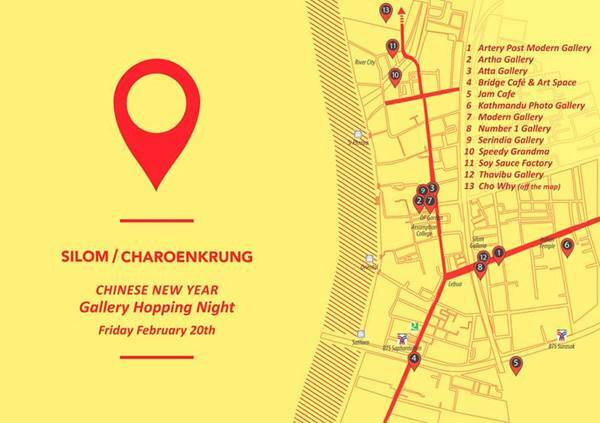 We are happy to announce our 2nd Silom/Charoenkrung Gallery Hopping Night: “Chinese New Year” Hopping Night, which is scheduled for Friday, February 20, 2015. Thirteen art galleries and art spaces in the area are working together to organize the Gallery Hopping Night. Participating spaces are to be open until at least 11pm on this special night, with special events and activities planned for gallery hoppers. Map, suggested routes and list of activities will be posted online on our Facebook page as the night approaches. Free drinks, art talks, performances, music.